Sixth-grader Sedra Khatib cried on her first day at Lakewood Elementary School in Durham a year ago. 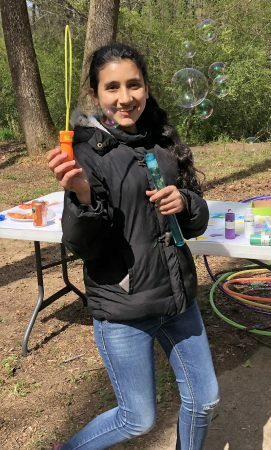 Sherwood Githens Middle School sixth grader Sedra Khatib blows bubbles at the annual Community Field Day at Rockwood Park in Durham. The event, hosted by UNC-Chapel Hill Muslim Students Association and the Zakat Foundation, brings together different refugee families for a day of entertainment outside. Staff photo by Ramishah Maruf. At the time, Sedra barely spoke English. Sedra, along with her parents and eight siblings, arrived in Durham as refugees 1 1/2 years ago. Before their resettlement, the Syrian family lived in Jordan for four years. But on Saturday, Sedra was talking about the friends she made at Sherwood Githens Middle School in nearly perfect English. 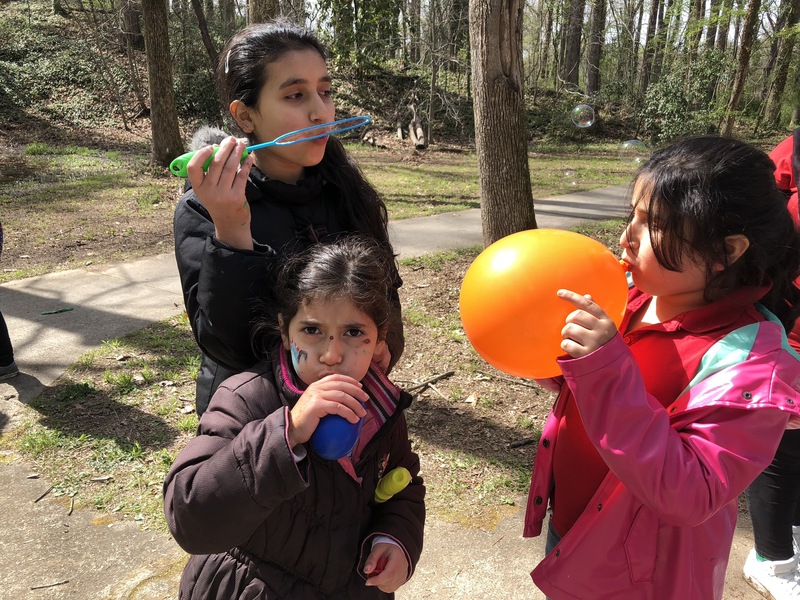 She and other refugee families gathered at Rockwood Park near the Forest Hills neighborhood in Durham for the annual Community Field Day, hosted by the Zakat Foundation of America and the UNC-Chapel Hill Muslim Students Association. The Zakat Foundation is a Muslim-run charity organization that recently opened a community outreach center in Durham. The ZF helped the UNC MSA get in contact with refugee families. The UNC MSA volunteers with refugee families every week, and the ZF provides financial support for the annual field day. The field day featured a bounce house and stations for temporary henna tattoos and face painting. Mothers chatted with each other as children painted in the art studio and ate cotton candy. “It’s a great bonding experience,” said Alghorazi. According to the News & Observer, 2,475 refugees arrived in North Carolina in 2015, and ABC11 reported that North Carolina had the ninth-highest amount of Syrian refugees in the United States in 2016. When the Khatib family arrived in 2016, they were resettled in Durham. Their nine children, whose ages range from 5 to 23, were enrolled in Durham Public Schools. From the beginning, Sedra and her 13-year-old sister, Sana, said Durham was different from their school in Jordan. Sana said “juice” in a heavy accent, and Sedra whipped her head around and laughed. “Shoes? You want to buy shoes at school?” asked Sedra. “Juice! I said juice!” said Sana. They both dissolved into giggles. Alghorazi said the language barrier is only the first obstacle new refugees have to face when arriving in America. “Once you learn the language you have to learn the culture as well,” said Alghorazi. When Sana first began school in Durham, she said many people made fun of her for not knowing English. However, Sana said she has more friends at school now, many of whom are also from the Middle East. The Khatib sisters enjoy their life in Durham. Although Sana said she misses the food in Jordan, she found a restaurant in Durham that she loves. Sedra appears to be a budding photographer. She pointed to a wall with a Dr. Seuss quote, noting it would be a good backdrop for pictures. She directed to where her younger sister should stand for a picture, and blew bubbles into the frame of the shot. “I thought it would make the picture prettier,” Sedra said sheepishly. Ramishah Maruf is a first-year journalism and political science major at the UNC-CH School of Media and Journalism. A Fort Lauderdale, Fla., native, she is the arts editor of the Durham VOICE. This entry was posted in Community-building. Bookmark the permalink.